If you don't recognize the location of this photo of downtown Phoenix, it's not surprising. Phoenix has changed a lot since 1901! 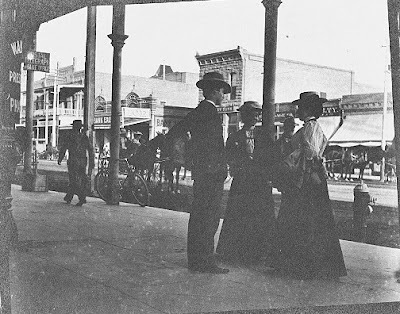 But if you look carefully, you will see that they are standing in front of Wakelin's Pharmacy, which was on the northeast corner of Washington and 1st Avenue, in a building that was called the Monihon Building. Across from them, looking southeast, you can see the original location of Valley Bank (right behind his hat), which was on an alley that ran north and south between Central and 1st Avenue, called "Wall Street" (never officially on a map, but people called it that, as there were several banks there). I found this photo several years ago and I never get tired of looking at it. It's a nice little "slice of life" of territorial Phoenix, including bicycles, horses, and even a fire hydrant. That fire hydrant, by the way, is in the same place nowadays, in front of Tom's Tavern.